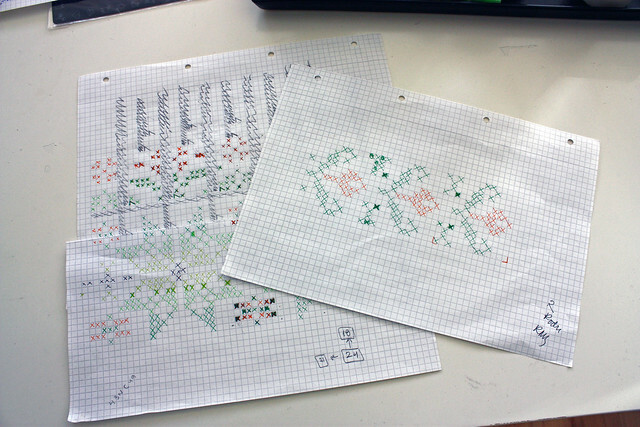 RodPrjónar: Needles in a frame and trying to make a pattern. Needles in a frame and trying to make a pattern. Remember all the things that Judi sent to me? Among all the things there was a pair of needles that belonged to her grandmother. A pair of double pointed needles size 3 (3.25mm) and 11" (27cm) in lenght. Well, I think it is such a nice piece (almost like a museum piece) that I was thinking that it would be nice to have them framed. To do so I needed to find a nice frame that would honour the beauty of this needles. Last weekend we went to a farmer's market very close to Reykjavík (in Mosfellsbær) to buy some fresh and locally produced vegetables. When we were coming to the market and just before entering into the farm I saw a couple of women that were taking things out of their car and putting them on a table. They were probably getting rid of some old things by selling them outside of the market. One of them was very familiar... I actually recognized her almost immediately: it was Hafdís Huld, an icelandic singer (know fro having been part of a band called Gusgus and now for her solo career). After having bought some vegetables I stopped by to take a look at what they were selling. And yes! They had a perfect frame for my needles! So, I bought an old frame for only 250 ISK (about 2USD)!! A little bit about knitting. 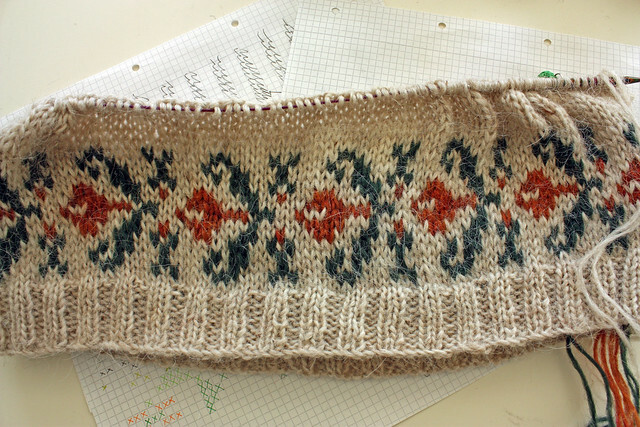 On Ravelry, in the Spanish swap group, a few weeks ago was proposed to make a new KAL and this time it would be to knit a lopapeysa. The KAL was suposed to begin in September but there is a little bit of delay because some of the people who is taking part of it are waiting for the wool (lopi) to arrive (since they made the order on the internet). In the mean time I have been thinking about what pattern to use for the yoke, sleeves and waist. I really didn't feel like using any from the magazines. I think I have alreadt knitted all myt favourite ones so that meant only one thing: It was time to try to make my own pattern. With the help of the book Íslensk sjónabók I have been trying to make the charts using paper and color. It is not as simple as I thought. It is kind of complicated to find the right spots to put the decreases but with some patience I guess I will work this out. I still haven't finished the yoke pattern... I guess i will decide how to finish on the go. I don't know. I will see. I already chose the colors and decided to begin just to see how the waist pattern would look like. I think it doesn't look so bad at all! Besides this I am knitting a shawl based on an Estonian pattern and recently me, Gummi and Kristín have started a new KAL. We are now knitting a Hyrna Herborgar (which will my my 3rd!). Which reminds me that I still have to post the pictures of our first KAL (the Aeolian!). Next time I will be talking abut the new shawl, the new KAL and the old KAL pictures! 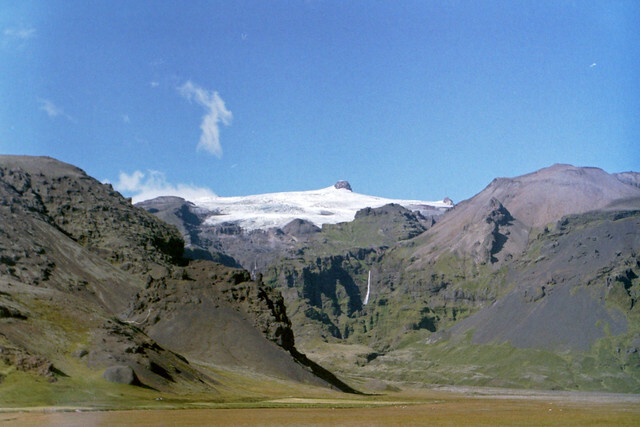 This is in Skaftafell, a national park. Bueno!! Además diseñador de lopis, que artista más completo. Hello,Kind Sir - sounds kind of formal, doesn't it? I loved the picture of the farmers' market's fare. Michigan has wonderful farmers' markets, sinceit's an agricultural state, and I miss them terribly. 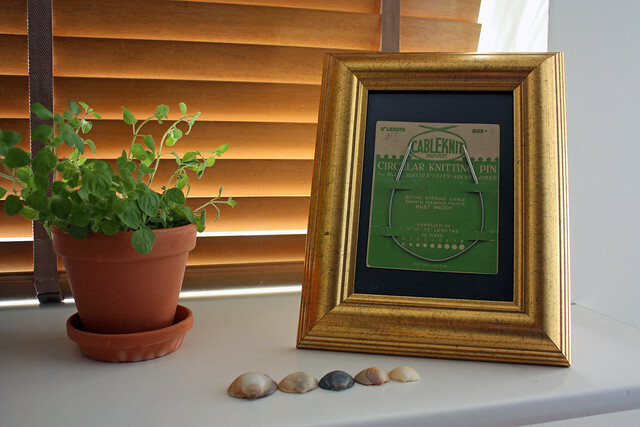 What a great find for you-the perfect frame for the needles and at such a fantabulous price! You are such a sweetie to treasure those needles so. Thank you.They look glorious framed.I love the shells lined up on the shelf. Liked the song. I think we would call her a folk singer. Liked the video, too. Really cute gal. I can't believe you are now making your own patterns! But then, I don't know why I'm surprised considering your unbelievable talent! I love the the waist pattern. Don't know if you intended it, but I think it looks like flowers. I like it:-) Like the colors you chose, too. Is the snowflake(? )on the paper going to be part of the yoke pattern? I can hardly wait to see the finished lopapeysa. It's going to be pretty. Are you going to st-eeek it? You are certainly going to be one busy knitter! Anxious to see what yarn/colors you choose for Hyrna Herborga shawl. I don't think you can top that last one you did. Do you find it a bit boring after doing a pattern like that once or twice? Easier, I presume. 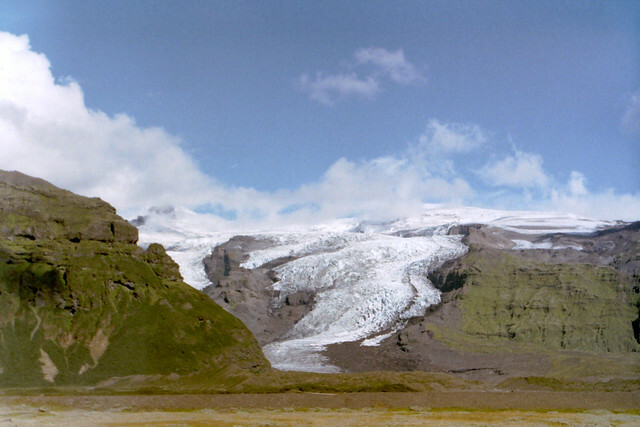 I have never seen an actual glacier. Iceberg, yes, but not a glacier. Fascinating. Is there an area where people can actually walk on it? Do they? If so, is it safe? 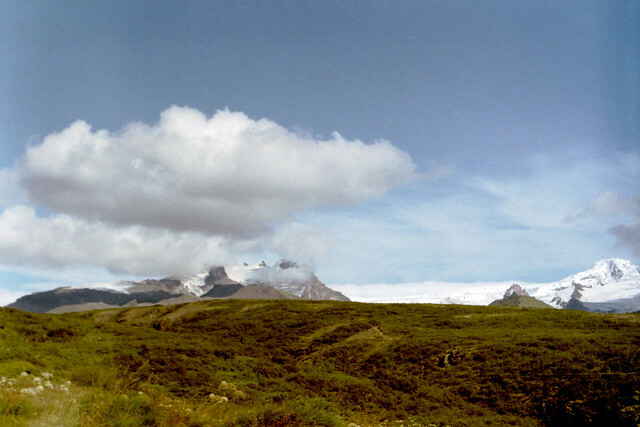 In the third photo, it looks like some creepy thing slithering down the side of the mountain. Love the last photo. So beautiful. All of your photos are fabulous. que cosa mas hermosa de verdad, y que artista de la lana !!! para avistarte que el paquete ya llego por alla, asique esta por caer rodri !!!! oh i love your pattern - it is wonderful! ¿Qué pienso yo? que eres un maestro o como dice mi hijo menor "eres seco" que para este caso es lo mismo. Me encantaron los colores y seguro que queda hermoso como ya se ve. Gracias por visitar mi blog y sí mi perro es un Fox Terrier Chileno, regalón como el solo y como dice mi hija el cree que es un niño, porque no conoce los espejos. 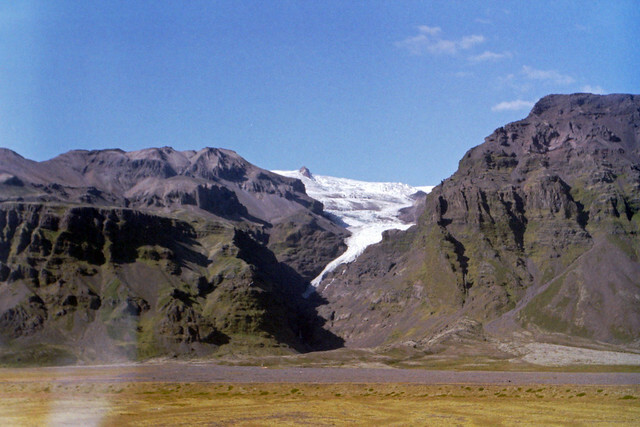 Judi: it is possible to walk on the glaciers. There are guided tours to do it. I am not sure I would do it. I think it can be a little bit dangerous. There are creeks in the ice sometimes and I wouldn't like to be swallowed by a glaciar, hehe. It is probably ok but I am a chicken :p lol.